Communications Biology published its first articles on January 22, 2018. In this collection, our editors highlight some of their favorite papers from our first year of publishing. This collection also includes all Review and Comment articles published during our first year. Our selected papers celebrate the diversity of our content across the biological sciences, including both fundamentally new biological insights and innovative methods for enabling research. To celebrate some of our most-read articles, we have also commissioned 'After the Paper' Comment articles from a few of our authors. These will be added to the collection as they are published. Finally, we link to all 'Behind the Paper' posts published by our authors on some of the Nature Research community sites. Communications Biology is an open access journal from Nature Research publishing high-quality research, reviews and commentary in all areas of the biological sciences. Research papers published by the journal represent significant advances bringing new biological insight to a specialized area of research. Read more about the journal here. Communications Biology is edited by both in-house professional editors and academic Editorial Board Members. Our editors work closely together to ensure the quality of our published papers and consistency in author experience. Lawrence Reeves et al. report evidence that adult females of the mosquito species Uranotaenia sapphirina feed primarily on annelid hosts. This is the first known example of a mosquito species that specializes on invertebrate blood and suggests that mosquito host use patterns are more diverse than previously recognized. Mathew Seymour et al. investigate the persistence of environmental DNA (eDNA) in river systems in environments of varying pH. Using four sets of upland stream mesocosms, they find that eDNA degrades to non-detectable levels within two days and this degradation is accelerated in acidic environments. Tomochika Fujisawa et al. 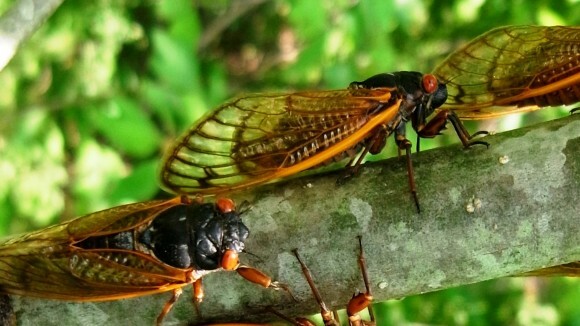 report transcriptome sequencing and demographic history analysis of periodical cicadas from three species groups within the genus Magicicada. They find evidence of gene flow between 13- and 17-year species despite the long-term maintenance of divergent life cycles, which may be controlled by unidentified genomic factors. Brian Brown et al. report the results of the Zurquí All Diptera Biodiversity Inventory project, one of the largest efforts to date to directly assess species richness of a megadiverse order of insects. The authors identified 41,001 flies to 4332 species, including 73 of the world's 160 Diptera families. Rosa Thorolfsdottir et al. report a genome-wide association study of atrial fibrillation in 29,502 cases and 767,760 controls from Iceland and the UK Biobank. They identify a significant association with coding variants in RPL3L, the first ribosomal gene implicated in atrial fibrillation, and MYZAP, an intercalated disc gene. Andreas Pavlogiannis et al. present an approach for constructing strong amplifiers of natural selection using evolutionary graph theory. They also identify features of population structures that are necessary for amplification and suggest their algorithm could be used to construct amplifiers in vitro. Yoshitaka Kamimura and colleagues combine live-imaging technology with microfluidics to examine chloroplast DNA organization in nucleoids. They find that these structures form a network structure in dividing chloroplasts, and propose a mechanism for their inheritance in organelle replication. Priyanka Chaurasia et al. report crystal structures of the SpaD backbone pilin from a gut-adapted bacteria, Lactobacillus rhamnosus. The observed bent conformation of the N-terminal domain has not been seen in other Gram-positive pilin structures. Olivia Walton and Martin Stevens revisit the classic example of the peppered moth, objectively quantifying moth camouflage and predation risk. With bird vision models, pale individuals more closely match lichen backgrounds, and survive better, providing support for this iconic example of natural selection. Keita Muro et al. identify PICALM5a and PICALM5b as key proteins involved in pollen tube growth in Arabidopsis thaliana. Plants deficient in these two proteins exhibit decreased fertility, with impaired pollen tube integrity. Jessica Ericson et al. examine the viability of Antarctic krill when exposed to near-future levels of ocean acidification for one year. These lab-based simulations of future ocean acidification show that adult krill actively maintain their body acid-base balance, enhancing their resilience. Kyra Burnett et al. present a simple and economical method to encapsulate small living organisms for long-term microscopy in a photo-crosslinked polyethylene glycol hydrogel. This method provides a fast and gentle mounting for continuous imaging over hours, and works with light-sheet microscopy and optogenetic stimulation. Yohei Hayashi et al. present a method for high-speed adherent cell sectioning and purification, along with a label-free and automatic cell processing system. They show that this method is able to section human induced pluripotent stem cells without losing pluripotency and viability. Chun-Ting Cheng et al. demonstrate that arginine starvation kills arginine-auxotrophic cancer cells by depleting them of aspartate through asparagine synthetase (ASNS) and disrupting their mitochondrial metabolism. This study presents ASNS-induced aspartate depletion as an anti-cancer therapeutic strategy. Shinya Sugimoto et al. demonstrate how molecular chaperone DnaK regulates biofilm formation through the production of curli, which anchor enteric bacteria to the biofilm. This finding provides mechanistic insights into the development of anti-biofilm agents as antibiotics. Yichen Ding et al. identify a novel integrative and conjugative element that confers Pseudomonas aeruginosa with resistance to carbapenem, the last-resort drug for susceptable Gram-negative bacterial infections. This study also shows how antivirulence treatment for P. aeruginosainfections can be challenged by horizontal gene transfer. García-Rosales et al. identified three distinct neuronal populations within the auditory cortex of awake Carollia perspicillata bats. These neurons responded to different temporal features of communication calls from conspecifics and synchronized to distinct cortical oscillations, suggesting multiscale temporal representation at a cellular level. Makiko Kawaguchi et al. developed an inducible Spint2 knockout mouse model which exhibited extensive damage to the intestinal epithelium and resulted in death six days after tamoxifen-induced gene ablation. The extreme phenotype observed in this inducible line suggests an important role for Spint2 in maintenance of healthy intestinal epithelium. HaeWon Jung, Tao Liu et al. combine multimodal adaptive optics with indocyanine green angiography to improve imaging of the human eye. This combination allowed visualization of photoreceptors, retinal pigment epithelial cells, and choriocapillaris of the living eye with remarkable resolution. Roy et al. showed that activation of parvocellular pre-autonomic oxytocin neurons increased sympathetic nerve activity following myocardial infarction. This and other aberrant physiological changes induced by acute myocardial infarction were decreased by oxytocin receptor antagonists, hinting to their potential therapeutic role. Mona Shehata et al. find that cell proliferation within the mouse mammary gland is highly heterogeneous, both between and within estrous cycles. Their study highlights the need for further understanding of the link between human menstrual cycle numbers and breast cancer risk. HoangDinh Huynh and Yihong Wan investigate the role of the mTORC1 pathway during osteoclastogenesis and find that the cytokine RANKL inactivates mTORC1 via calcineurin-mediated dephosphorylation, leading to activation of NFATc1 by reducing its phosphorylation. These findings have implications for bone diseases and mTORC1/NFATc1 signaling. Sk. Kayum Alam et al. show that DARPP-32 isoforms, mediators of dopamine signaling, promote lung tumor growth through non-canonical NF-κB signaling. This study suggests a possibility of using DARPP-32 isoforms as a prognostic marker for lung cancer. Joseph Brown et al. use oligothioetheramides (oligo TEAs) to show that multimeric lipid aggregation in Staphylococcus aureus mimetic membranes correlates with the biological activity of oligoTEAs. These results may explain why antimicrobial peptides with identical cationic charge and hydrophobicity show different biological activity. George Roff et al. report a 74–92% decline in the catch per unit effort and concurrent declines in body size of large coastal apex sharks near Australia over the past five decades. This study highlights shifting baselines of shark populations in coastal shark assemblages, and indicates that shark populations are highly vulnerable to exploitation. Communications Biology celebrates its 1 year anniversary of publishing advances across the biological sciences. Here we review our first year of publishing and look forward to what we hope to achieve in the years to come. In honeybees, genotypically identical females develop into queens or sterile workers, depending on their diets. In this review, Ryszard Maleszka discusses the controversial role of the royal jelly protein Royalactin in caste determination and provides a framework for moving beyond the master inducer concept. Melinda Mills and Charles Rahal discuss genome-wide association studies published in the last 13 years, finding increases in sample sizes, rates of discovery, and traits studied over time. They discuss limitations, including sample diversity, and make recommendations for scientists and funding bodies. Tim Koopmans and Yuval Rinkevich review recent findings linking the mesothelium’s embryonic programs that drive epithelial-to-mesenchyme transition with adult pathologies, such as fibrosis, acute scarring, and cancer metastasis. They highlight new avenues for drug development that would target pathways of the mesothelium’s mesenchymal transition. Marco Bürger and Joanne Chory discuss the structural requirements for enzymes carrying out deacetylation reactions for various functions across phyla. They explore how these enzymes have adapted to and achieved specificity on a large number of target molecules. Alan Herbert discusses the properties of Z-DNA and Z-RNA, interactions with ADAR and other Z-binding proteins, and the role these elements play in disease. He also discusses the implication of Z-forming sites in genome evolution. Volker Hartenstein and Angela Giangrande discuss recent advances and future directions in glial biology and evolution in the context of a recent scientific conference. Their Comment illustrates the importance of interdisciplinary approaches to answering outstanding questions in biology. Caroline Palmer proposes the concept of coral holobiont damage thresholds to stimulate research into coral health and immunity as tropical reefs are increasingly threatened by climate change. This framework may be used to develop targeted approaches to coral reef restoration, management and conservation. In this Comment, Ngan Huang et al. discuss recent advances in cardiovascular tissue engineering and some of the main challenges that remain in translating these advances to the clinic. The authors propose future direction for the field to focus research efforts. We are pleased to introduce Communications Biology. Our aim is simple: to provide a place for all biologists, regardless of research topic, to publish high-quality work that advances their field of research. Scientific investigation is grounded in the objective pursuit of facts as guided by the scientific method. The process by which new results are vetted and communicated publicly—peer review—should be guided by similar principles. Today we publish a Q&A with Dr. Marie Heffern, the first in a series of short interviews with early career researchers. We will be publishing these throughout the next year and welcome suggestions for featured researchers. A year has passed since Communications Biology opened for submissions. We’d like to take this opportunity to look back on the past year and thank all those who have contributed to the journal. Saunders et al. discuss the latest research and strategies used to control wheat stem rust in Western Europe following their report of its recurrence in the UK for the first time in almost 60 years. In their Comment, they hope to build on their previous work to drive innovation in disease management. Mathew Seymour discusses the current status of using environmental DNA derived directly from natural environments to study biodiversity, and its applications in conservation and ecological research. In his Comment, he explores how eDNA as a technology can foster multi-disciplinary collaboration. Fabien Pifferi et al. discuss the latest research in using caloric restriction for promoting healthspan and lifespan in primates. Their Comment touches on their previous study, addressing how to combine nutrition-based clinical protocols with interventions to delay the onset of age-related diseases.